Writer. Children's Pastor. Husband. Dad. All around lucky guy. This is part one of a new beach-themed series called Cowabunga. You can also listen to this devotion on the Family Jetpack Podcast. Big Idea: Following Jesus is the best way to live. If your friends are tricky, they’ll hide under the water, duck behind other kids or just try to swim away as fast as they can. By following the sound of your friends’ voice, you can end up crashing into other people, get tangled up in water toys or stub your toe on the edge of the pool. Marco Polo teaches us we have to be careful whose voice we follow because sometimes following the wrong voice can lead to all kinds of trouble. Even when we’re not playing Marco Polo, we follow people in all kinds of ways Sometimes we do things, like play a sport or wear certain clothes or laugh at a joke, just because our friends are doing it. We’re following their example. We’re kicking off a new family devotional series for the spring break season called Cowabunga. Cowabunga is a word associated with old surfer movies (or the Ninja Turtles for all of us 80’s kids), and it’s really just a fun expression of enthusiasm for riding a wave or jumping into an adventure. In this series, we’re going to help kids take a look at what means to follow Jesus and jump into an adventure with him. Just in time for spring break, we’ll explore several beach-themed stories about Jesus and his friend Pete, who went surfing with Jesus without even using a board! So whether you’re going to the beach soon or just like to think about it, stick around for the Cowabunga series to help kids discover how to catch the wave of God’s love and follow Jesus wherever he goes. You can check out Cowabunga Part One here or listen to it on the Family Jetpack podcast. You can also listen to this devotion on the Family Jetpack Podcast. This is Part Three of a three-part series. You can catch up with Part One and Part Two here. Big Idea: God wants me to use my gifts to serve others. What if you received a present for your birthday but had no idea how to use it? What if you didn’t even know what it was or what it was for? How would you react? Would you ask questions or just pretend like you knew what you were doing? If you didn’t ask any questions, you might end up taking this doohickey or whatchamacallit and using it in all kinds of wrong ways. Let’s pretend for a second you had never seen a skateboard in your life, but your aunt got you one for your birthday. What if you opened it up and thought it was a car for your cat? Pretty silly, right? That would cause all kinds of confusion. Not only would your cat probably be a little upset over you pushing it around on a skateboard, you would be missing out on the fun of riding it yourself. We all love fun surprises, don’t we? About 2,000 years ago, God gave us the biggest and best surprise of all time. After three days in the tomb, Jesus was alive again! This Easter, help your family rediscover the wonder of the resurrection story through the Best Surprise Ever devotional book. In this seven-part series, your kids will get a close-up look at Jesus’ surprising power and grace. 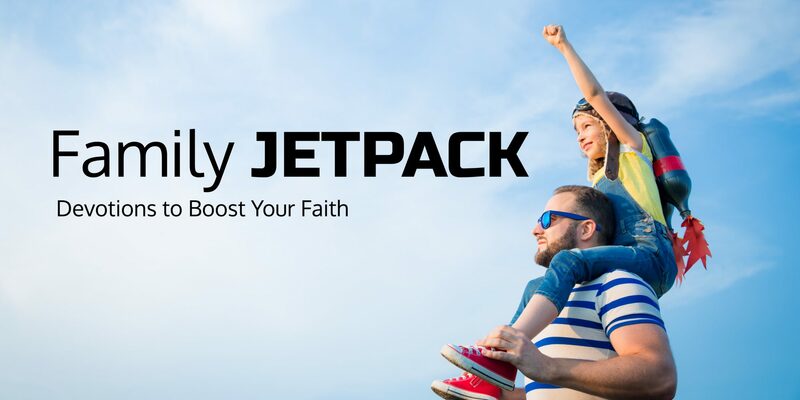 When you sign up for the Family Jetpack email list, you will receive the Best Surprise Ever ebook delivered straight to your inbox. Sign up for your Best Surprise Ever Easter ebook and get ready bring the Easter story to life for your kids. This is Part Two of a three-part series. You can catch up with Part One here. Big Idea: God’s plans take time. Have you ever had to wait on something good? Whether you’re waiting for cookies to bake in the oven or waiting for a special day like Christmas, waiting is never easy. But the best things in life often take time. The same thing is true for God’s plans. Remember Joseph? He was only seventeen years-old when God told him he had big plans for his life, but none of those dreams would come true for another thirteen years. Thirteen years! That’s a long wait. Imagine waiting thirteen years for cookies to bake or thirteen years for your next birthday. Joseph had to wait thirteen years before God’s plan became reality. You can listen to this devotion on the Family Jetpack Podcast. Big Idea: God has big plans for your life. What do you want to be when you grow up? A doctor? A teacher? A mom or dad? Maybe a scientist or writer or a famous basketball player? Or how about an actor or a superhero or President of the United States? You may have big plans for your future, but guess what? God has even bigger plans for your life than you do. He wants you to be a part of his mission to save the world. That’s more awesome than any job you could ever have. Just ask a guy named Joseph. Joseph was one of twelve brothers. Can you imagine that? A house with twelve brothers? That would be one wild house. But in Joseph’s case, it was also a dangerous house. That’s because Joseph’s brothers hated him. They were jealous that their dad liked Joseph the best and gave Joseph cool presents like a fancy coat. The more Joseph’s dad played favorites, the worse it got. You can read the devotion below or listen to the audio in iTunes. Big Idea: We can share Jesus’ love by putting others first. I want to go first. Let me have the first piece. No fair! Why is she always first? Or how about this one? Have you ever blamed something you did on your brother or sister because they did it to you first? Whether it was saying unkind words, making mean faces or hitting each other, kids having been using that excuse for years. Like that makes it okay! We all know it doesn’t, but sometimes we use that excuse anyway to try to get ourselves out of trouble. Okay, so those are some bad ways we use the word first, but what would you say if I told you you could actually use the word first in a good way? In fact, the Bible tells us that the phrase, “He did it first!” can be an excuse to do all kinds of good things. 1 John 4:19 says, “We love because he loved us first” (NIrV). Jesus’ friend John wrote this about Jesus. He’s saying that Jesus’ love should be our example for how we treat others. Remember, Jesus loves people who no else loves. Jesus loved people who were mean to him. Jesus loves people who’ve done wrong things. Jesus loves everyone all the time no matter what. Holidays and special events are a fun excuse to get your family talking about faith. Gather your family together for the following devotion time before the big game. Big Idea: Jesus wants to train us to be like him. It’s almost time for the biggest football game of the year. Two teams. 60 minutes of game time. Millions of fans watching around the world. Everything comes down to this one big day to see who will become the ultimate champions. What do you think it would feel like to play in such a big game? Would you be excited? Scared? Nervous? What would you do to get ready? Would you work out and practice with your team or just sit around and eat donuts and watch TV? You’d practice, of course! You’d train, lift weights, run drills, eat the right foods, watch game videos and, basically, do whatever your coach told you to do. If you were playing in the biggest game of your life, you’d do everything you possibly could to train yourself to win. The Bible says that following Jesus is a little like that. Every day of our lives is a big deal, bigger than any game. Every day we’re either choosing to live life God’s way or just live for ourselves. When we live life God’s way, people around us see Jesus in us and have the chance to become friends with God too. You can read the devotion below or listen to the audio in iTunes. Here’s Part One, Part Two and Part Three if you need to catch up. Big Idea: God is everywhere, and I can always turn to him for help. Have you ever played hide-and-go-seek? How good are you at hiding? Do you have special hiding places where no one can find you or do you get caught right off the bat? Even if you have the hiding skills of a ninja, there’s someone you can never hide from. That’s God. Why? Because God is everywhere all the time. If you try to hide from God under your bed, guess what, he’s already there. If you sneak into your backyard and crawl beneath the bushes, God is already there too. Even if you hop on an airplane and fly to the other side of the planet, take a jeep into the deepest, darkest jungle, and then climb down into a cave until you are miles underground, you would discover that God is already there too. You can read the devotion below or listen to the audio in iTunes. Here’s Part One and Part Two if you need to catch up. Big Idea: God knows everything, and he always understand me. Who’s the smartest person you know? Your best friend? One of your parents? Your teacher? Or maybe it’s you. Some people seem to know everything. They can name all the U.S. Presidents and the capital of every country in the world and even tell you who won the very first World Series in 1903. Other people know a lot about science or medicine or cooking or how to build incredible sculptures out of LEGO bricks. God has filled the world with smart people, but even the smartest people on earth don’t know everything. The only one who knows everything is God. Psalm 147:5 says, “Great is our Lord. His power is mighty. There is no limit to his understanding” (NIrV). No limit! I work for a church called Southland but this is a personal blog. The opinions and recommendations expressed are my own. They are not intended to represent Southland in any way.